Should A Fire Weather Warning Worry You? Fire weather won't concern most city dwellers, but understanding it could be critical to people living in a rural environment. Every year in the USA there are tens of thousands of wild fires, mostly small and easy to control. In bad years thenumber may climb to around a quarter of a million, and the cost of fighting them runs well over the billion dollar mark. Better communications, emergency services and fire fightingtechniques have resulted in reductions in deaths from thehundreds who died in major fires in the 19th and early 20th centuries, but damage to housing, forests, and agricultural and grazing land remains high. Three major factors interact to determine the extent and severity of a wildfire - weather, terrain, and availability of fuel. This interaction makes fire fighting and fire prevention a very complex challenge, and even the effectsof weather can be quite diverse. Fire weather is the combination of temperature, humidity,wind strength and chance of thunderstorms that meansthat the chance of fires is high, or that control ofany existing or new fires will be difficult and livesand property may be in danger. When weatherconditions are threatening, fire weather warnings areissued to areas at risk, and can be monitored on weather radios. But the conditions that favour fires may have resulted from weather patterns months or even years in the past. 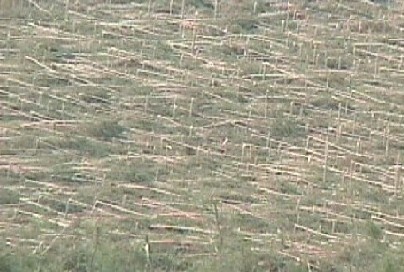 For example, good winter or spring rains will encourage strong grass growth. A hot summer will dry off the grass, leaving a thick accumulation of fuel available for any fire that starts. Similarly heavy winter rains in southern California will encourage rapid growth of highly flammable scrub, ready and waiting for the hot dry summer. Strong winds occurring in microbursts during severe thunderstorms can also knock down acres of trees, which die and dry out to form a thick layer of fuel guaranteed to cause problems during the next fire. Not so far in the past are the weather events of the preceding days or weeks. A stationary ridge of high pressure in summer can result in days of hot fine weather, often with gradually increasing temperatures each succeeding day. The continued heat dries out the vegetation, increasing its fuel value for any subsequent fire. Even worse is the longer lasting effect of drought , particularly on forests, as both the living trees and debris on the ground lose much of their moisture. There are many combinations of weather conditions that combine together to create a strong chance of fire weather - the combination of high temperatures, low humidity and strong winds. But there are two considerations here - risk of fires starting, and weather that aids the spread of fires and hinders their control. In accessible or settled areas most wildfires are started by humans. Most are accidental, but many of the deliberately lit fires occur, not by chance, on high risk fire weather days. So in some ways the warnings can serve as wake up calls to the arsonists. But in remote areas the chief cause of fire is lightning, and the greatest number of lightning-caused fires occurs on days where there is enough instability to cause continued convection and thunderstorm development, but not enough moisture in the air to result in significant rainfall. Dry thunderstorms form, cloud to ground lightning can ignite fires, but there is not enough rain in the storm to put them out or hinder their spread. And even dry storms are accompanied by strong winds, so the chances are high for a lightning started fire to take a firm hold with the help of gusty winds. Storms can also occur in advance of cold fronts, so a few hours of lightning caused fires can be followed by wind changes, often strong, as the front passes through. These conditions can increase the severity of the fire, as well as increasing the dangers for fire fighters. So overall fire weather is characterized by heat and strong winds. Short lived strong winds accompany thunderstorms and cold fronts, but the most dangerous elements of fire weather are winds which may continue for days, bringing heat with them but no relieving rain. The main culprits go by the general name of foehn winds. They occur on the lee side of high mountain ranges when a weather system passes through after dumping most of its moisture as rain or snow on the windward side of the range. As the winds cross the mountains they begin to descend, and increasing air pressure causes them to warm up. Once they hit the plains or basins they have accumulated significant heat, and are moving at 30 - 50mph (50-80 kph), with stronger gusts particularly when they channel through valleys or passes. In North America these winds are known as Chinooks on the eastern side of the Rockies, as East Winds in Washington State, Oregon and northern California, and as the Santa Ana in southern California. So we have the ingredients of ideal fire weather- hot dry air with strong winds, and even stronger gusts. In some cases the overall conditions may also be right for thunderstorms to form, adding a little lightning to the mix. However experience would suggest that there is sufficient human carelessness and malice to provide more than enough artificially started fires. Other factors which may complicate the picture include low level jets. Related to the jet stream flows, these winds occasionally occur around the tops of ranges. As turbulence increases during the day, these winds can descend to ground level, bringing winds with speeds around 30mph (50kph). Not only can these add to the problems of fire fighters by increasing wind velocity, but they can also come from a different direction, turning the fire to a new path. As normally used, fire weather is a term for weather that supports the start or growth of fires. Another form of fire weather is that created by the fire itself. Flames heat the air, which rises, carrying with it soot, water vapour, and the other products of combustion. This rapidly rising air is replaced by air flowing in horizontally, bringing with it oxygen to assist the fire. It also makes the fire harder to control, and may combine with existing winds to help carry sparks and embers in front of the fire, starting spot fires. The turbulence caused by this combination of incoming and rising air can also generate firewhirls or fire whirlwinds in larger fires. Fire fighters really do have a lot to think about. Convection created by the fire can generate its own private thunderstorm, as water vapour released by burning vegetation condenses above the fire. Lightning and rain can result, although the rain is rarely enough to have much effect on the fire. The name for the clouds formed in this way is pyrocumulus. 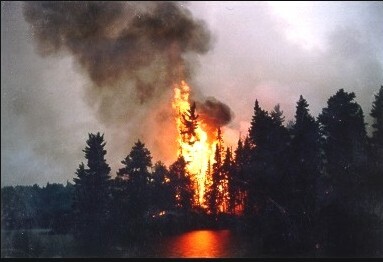 Large fires in rugged or remote country are extremely difficult to control, let alone extinguish. There are really only two ways to put out a fire - deprive it of fuel by creating barriers in its path, or wait for a change in the weather to turn the balance in favour of the fire fighters. Heavy rain is of course the ideal. But not all the effect of the fire is confined to its immediate vicinity. The plume of smoke and gases is picked up by the prevailing winds at height and transported down wind. Many of the products of a fire can be dangerous, toxic, or health hazards - they would never be allowed from a commercial operation. They include very fine soot and carbon monoxide, which can cause problems to people with respiratory disorders. Consequently another function of the National Weather Service is to track the distribution of the plume. Health warnings are issued when necessary. Fire weather is rather obvious when it arrives, and is easily recognised from the temperature, humidity and wind sensors. It is often worth looking back to the beginning of the conditions which led to fire weather warnings being issued, and maybe even further back to the weather events which may have provided favorable conditions for fuel accumulation. Alternatively, as often happens, fire follows or accompanies drought, which may have a much longer period of development. 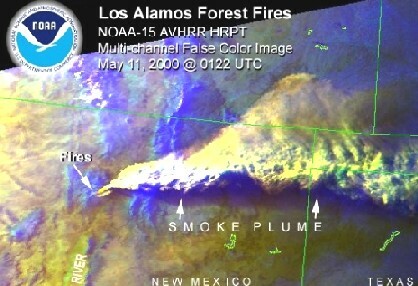 But it is also interesting to investigate the cause of any particular episode of fire weather. Quite often, more so in some areas than others, it is related to a change in medium to large scale pressure systems, both at ground level and at higher elevations. A common happening is the break down of an upper atmosphere high pressure ridge. The ridge is likely to have been the underlying cause of high temperatures and dry air which dried out the fuel prior to the fire. The ridge can decay quite rapidly under the attack of a surface trough, which often brings with it instability, convection, thunderstorms and gusty winds, all favourable for starting and growing fires. Clues to these features include pressure charts for the upper atmosphere (500mb charts), satellite images showing water vapour, and of course surface charts and radar. For more information I can thoroughly recommend a multimedia presentation on wildfires and fire weather by UCAR, the University Corporation for Atmospheric Research. Related types of hazardous weather are included in the Hot Weather pages. More information on weather Stations can be found on the Home Weather Stations page, and there is also a page to help you set your weather station up. Back to the Top, or return to the Home page.